"Many things are missing before the passion of my Christ." Hieromartyr Dorotheos was born around 255 and was bishop of the Phoenician city of Tyre, during the time of the persecution against Christians under the emperor Diocletian (284-305). He had a deep knowledge of both the Old and New Testaments. As long as Diocletian and Licinius ruled, he was absent from Tyre due to the persecutions and went to Dyssopolis in Thrace. When these emperors died and Emperor Constantine the Great ceased persecutions against the Church, he returned to Tyre and shepherded the Church of God until the reign of Julian the Apostate (361-363). 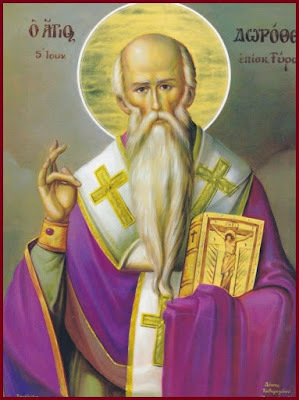 * Some ascribe to Saint Dorotheos the compilation of a work titled “The Synopsis”, a collection of sayings, and including lives of the holy prophets, the 12 disciples and the 70 apostles. Many scholars today do not believe he is the author of this work, though possibly a portion. 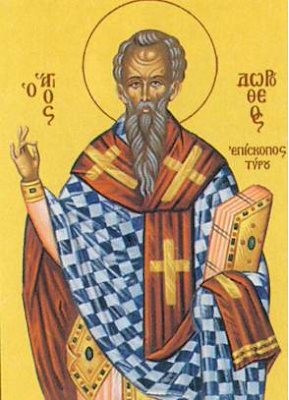 O Dorotheos, wise Hierarch of Christ, thou didst receive the light of wisdom as a gift from the Father of lights. Thou didst increase the talents given to thee, and contest in thine old age beyond the bounds of nature. And thou, O Hieromartyr, art interceding for our souls. By preaching Orthodox doctrine, O Hieromartyr, thou didst offer thyself as a godly and holy gift. 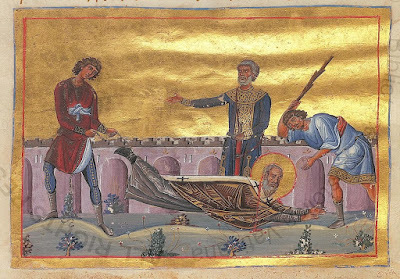 Thou didst first excel in asceticism, and then contest in martyrdom, and attain to receiving the victor's prize from Christ our God. Rejoice heavenly mystagogue, rejoice the beginning of perfect gifts, rejoice the good lot of the God of all, you who are most eminent in fame.